Capture and play back in Ultra HD resolution with Blackmagic Design’s Intensity Pro 4K I/O Card. Intensity Pro 4K provides the same functionality of the original Intensity Pro but has been upgraded to support Ultra HD 2160p at 30fps and Full HD 1080p at 60fps. Pull HDMI, YUV, S-Video, and NTSC/PAL sources to your computer and save them in compressed or uncompressed formats with the included Media Express software, bypassing unnecessary compression. Preview in real time on high resolution displays for more precise colour grading. Connect cameras for live streaming of events, seminars, presentations, concerts, video conferencing and more. Capture high frame rate gameplay in full 10-bit quality YUV video and deep colour. RCA video and audio inputs and outputs as well as SPDIF audio output is provided by a breakout cable, allowing you to work with equipment from HDTV HDMI displays to the decrepit VHS in your garage. 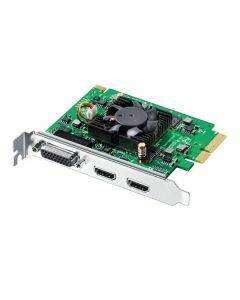 The Blackmagic Design Intensity Pro 4K is a 4-lane PCIe card compatible with four, eight, and 16 lane PCIe slots. Its HDMI video connections are switchable between SD, HD, and Ultra HD, and component analogue video connections can alternate between SD and HD. The HDMI connections feature HDMI standard 1.4b, supporting deep colour and automatically configuring to connected displays. Intensity Pro 4K is also directly compatible with all popular editing, design, streaming, audio, and video applications available for Mac and PC. This means enables capture directly to software in formats like ProRes, DNxHD, and QuickTime - avoiding additional steps and the potential for unnecessary extra compression. Work seamlessly with DaVinci Resolve, Final Cut Pro X, Premiere Pro, Fusion, After Effects, Photoshop, ProTools and more. The included Blackmagic Media Express software allows you to effectively capture, organize, and manage all of your media. Software Included: DaVinci Resolve Lite, Media Express, Disk Speed Test, Blackmagic Desktop Video.